When it comes to protecting your home or business, even if you have an alarm system or cameras, thieves can often find a way around them, especially if they know the system. The locks on the doors are your last line of defense. Are yours sturdy enough to provide the protection you want? At Rocket Locksmith, we want to help you keep your St. Louis home or business as secure as possible. If you’re looking for ways to improve security for your home or business, here are a few things you can do to boost security through your locks. First, one of the most important parts of a lock is the installation. Even if you have a particularly hard to pick lock, or a difficult to copy key, if your lock isn’t installed properly, a burglar will be able to force their way in pretty easily. Yes, you want to be sure that the locks themselves are securely attached to your door, but the point at which they insert into the door frame is just as important. Those small metal plates that go around the notches for the locks are there for a reason. Yes, they protect the wood of the frame from wearing away and loosening, but they also make it much harder for a burglar to just use some force and push your door open. The wood of a door frame on its own will give way fairly easily since it’s not usually made with the strongest types of wood; however, as long as the metal plates are installed well, the locks are much less likely to be forced. However, a big part of what keeps those metal plates securely attached to the door frame is the screws used. The screws should be at least three inches long to really hold a firm grip on the wood. 7-pin locks – The standard tumbler is only 5 pins and can be picked pretty easily with a lock picking kit or even bobby pins. The additional two pins mean it takes longer to pick these locks, so they work as a good deterrent for most burglars. Non-standard keys – There are a wide range of different lock options that use a non-standard key type, and a lot of these are more difficult or nearly impossible to copy. Higher security key options include those with dimples along the wide side, rather than notched into the narrow side, as well as keys with dual layers of notches or engravings. These are all a lot more work intensive varieties and cannot usually be copied by a machine, which cuts down on a lot of copied-key thefts. 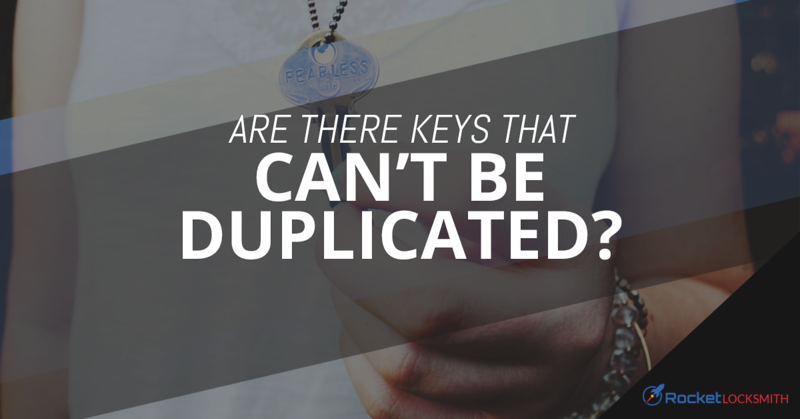 Restricted keys – This subset of keys extends beyond the “do not duplicate” restriction. A true restricted key is one that you have to go to a locksmith who is a licensed dealer in order to get a copy, because the blanks are different and have to come straight from the manufacturer. For more ways to improve the security of your home or business, or if you have questions about key cutting, your local St. Louis locksmith team is here to help! Contact Rocket Locksmith for key cutting and more locksmith services in St. Louis!